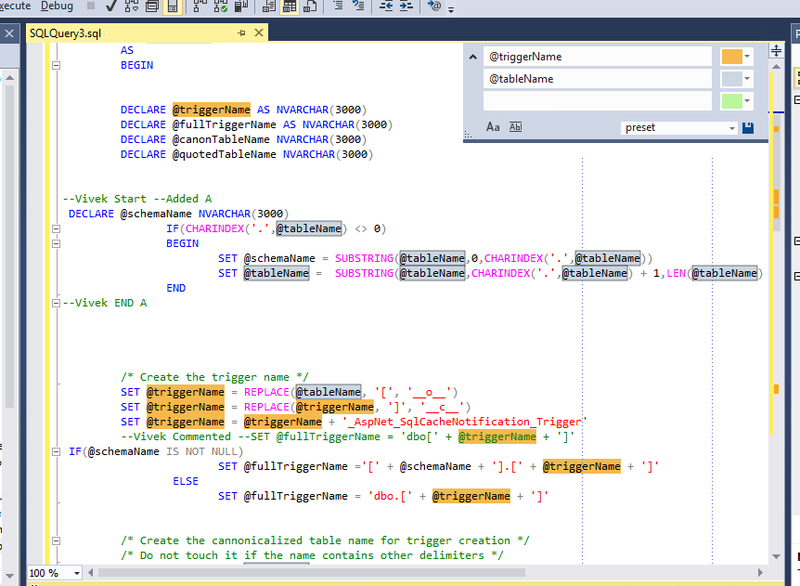 I'm continuously fighting with the standard search (CTRL-F) feature in SSMS. My greatest grudge is that it disappears and removes all highlighted results as soon as I hit the Escape key (which I need to do allot to get rid of some code-completion boxes obstructing my view). Only one search box is actually not enough. When I'm working on a large Stored Procedure there may be multiple things I'm interested in for example "Stock" and "@Quantity". Currently I can only choose one keyword (Column / Variable) to be highlighted by searching. It would be great if I could add multiple keywords with their own highlighting color. I might even want to save collections of them and reuse the same color scheme when working on certain bugs or features with similar aspects. It would also be nice if the colors show up in the scroll-bar, but that's just a nice-to-have. Understood and looks really useful. Could you please describe 1-2 usage cases more detailed, how would you like to have this? We are planning to upgrade our highlighter feature and your proposals are reasonable. Just take what you have written above and describe in more detailed steps. 1 user thanked Andrei for this useful post. Another use-case would be with an SP that does some synchronization, for example xml is provided to the SP as an argument, and it should update a set of tables. Now an extra field needs to be added to the SP (and XML). An easy way to handle this is to pick a similar field already existing, and add the new field to all statements wherever the similar one already occurs in the SP. However the XML field may have a different name than the table columns, and different tables may have columns with different names that should be affected by the new field... In that case this task becomes allot more challenging, but a colorful multiple-search feature would greatly help. I would also use the feature to discriminate between very similar fields, for example inc or ex VAT, purchase/sales price etc... These fields are used in multitudes of SP's and being able to color code them would relieve some strain on dyslectic eyes. 1 user thanked Louis for this useful post.